Please enter your first name and email below and hit the submit button. 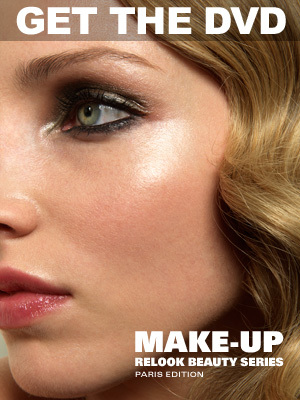 We will keep you up to date with new hair and make-up looks posted on this site. If your computer isn't the best place to try to follow the hair and make-up tutorials, then use your iPhone. All you need to have is an iPhone and a Wi-Fi network and you can surf a special verion of the RelookTV website. You can watch the video tutorials or even buy any of the DVDs right from your iPhone. So next time you are having a coffee outside and you want so see some new make-up ideas, bring your make-up bag and your iPhone. Simplly go to Relooktv.com from your iPhone and you will be on the iPhone version of the site. It's four looks in one make-up feature. Cathyanne MacAllister has actually done Kate Moss' make-up and knows first hand how to get that perfect sultry rock and roll look. Phase one of this make-up covers a great day make-up to go to work or school. Then phase two layers make-up right over your day make-up to create a little more drama and could be a look good for going out to dinner. Phase three's make-up goes on right over phase two and takes this look to the next level. If you are hitting a bar or club after dinner, this phase of this looks really shows off the beauty of this look with even more drama with the mascara around the eyes plus a couple beauty secrets for the eyes. With a lipstick change and some glitter eyeshadow, phase four adds even more drama to this look and would be considered a late night club look. All About Curls is a tutorial that covers all you need to know about transforming simple straight hair into cascading beautiful curls. With just a curling iron some hair spray and a hair brush, Vinz show how to mix different curling techniques to create exciting layered curls. Plus Vinz lets you in on a few beauty secrets that helps you get the final touch just right with this look. Every week more beauty videos are added plus news and more. If you want to keep up to date with what is happening with RelookTV, and Facebook is more your scene than the RelookTV newsletter, just join our Facebook page and get info there. You can also see what other people have to say as well.